Internet access from mobile devices now represents 63 percent of all traffic in the United States. Mobile now has more total page views than desktop. 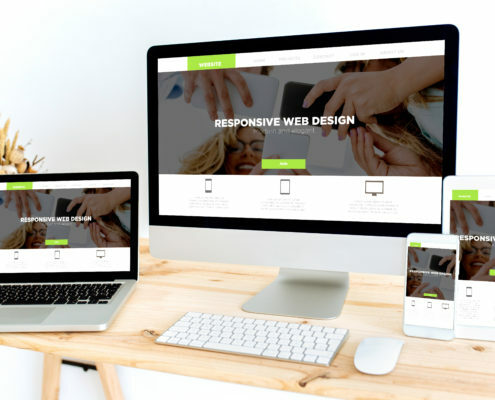 If your company has not adequately modified your website to function consistently across multiple sized device screens, the time to do so is now. In 2019, mobile advertising will represent 72 percent of all U.S. advertising spending, and with 83 percent of mobile device users indicating that a seamless website experience across all devices is important, it is imperative that a marketer’s web-presence is optimized for mobile. A poor mobile presence can make an organization appear unprofessional and out of sync with a web savvy consumer. Responsive Web Design (RWD), an approach to creating a website that allows it to work on any device; whether it’s a mobile phone, tablet, TV or a laptop, is mostly credited to Ethan Marcotte, an independent web designer and author who in 2010 said, “Rather than tailoring disconnected designs to each of an ever-increasing number of web devices, we can treat them as facets of the same experience. We can [make our] designs […] more adaptive to the media that renders them.” Today, a responsive web design can determine the effectiveness of a website. A recent study by Tyton Media, found that 94 percent of people cited web design as the reason they mistrusted or rejected a website. A responsive website design increases the chances that users will stay longer and engage more with a web experience. Three fundamental aspects of a responsive web design are fluid layouts, responsive images and media queries. Fluid layouts allow a website to automatically adjust fixed widths to expand and contract to display consistently on all screen sizes. This eliminates visual distortions and jumbled text and promotes a smooth and seamless presentation regardless of the device. Responsive websites have also been shown to have a greater likelihood of ranking higher in search engine results pages. Making images adaptive and responsive is a very important step in creating a responsive web design because it can affect both a website’s speed and its search engine friendliness. The ability for images to grow and shrink with a user’s browser to fit the web page will result in shorter page loading times, particularly when accessed on devices with 3G or slower connections. Media queries tailor a web page’s representation to devices with screens of any size and allow for specific rules for hiding, growing, moving or showing content, resulting in a better user experience. With more consumers spending a majority of time on the internet, it is critical that web designers create excellent, workable and responsive websites that focus on design, usability and accessibility across all devices. A well designed and responsive website will increase consumers’ trust and generate customer traffic and increased conversion rates. For more information on how Junction Creative Solutions’ (Junction) developers and designers can help make your website more responsive, call 678-686-1125 today.